To make applying as simple and straightforward as possible, we've put together a checklist of everything you need to complete your application. From detailed requirements to helpful how-to articles, the checklist below will help you navigate the application process. And if you have any questions along the way, please feel free to contact me. 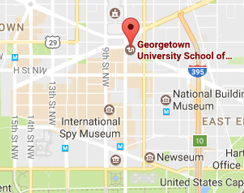 Georgetown University's School of Continuing Studies does not require GRE or GMAT test scores for admission to our master's degree programs. Your resume or CV should be no longer than two pages. Official transcripts from all undergraduate and graduate institutions in the United States, where credit has been earned, should be mailed to the Georgetown SCS Admissions Office. Transcripts should either be sent in an envelope sealed by the school's registrar, or via an official online transcript provider to scsadmissions@georgetown.edu.